Here is another quick example of a problem that we often see in customer feedback surveys. In this case, the question has been worded in a way that may change the way the respondent will answer. By prefacing the question (“Overall how satisfied…”) with the pejorative statement “… is continually striving to achieve 5-STAR customer satisfaction…” the company has subtly altered the respondents feeling towards their experience. 2. Increase the score: other people will subtly increase their score because they don’t want to disappoint the company by marking them down. The problem is that you will never really know the overall affect. The real pity is that you can just eliminate the first sentence and the question still makes sense – there is no need for that first sentence. Have a look at your customer survey now. 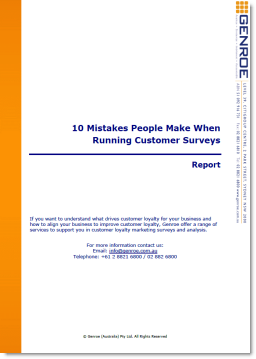 Have you put in any extra wording that prejudices the feedback from your customers? For what its worth, we use a dirt cheap customer feedback tool named ServeYouBetter.com. I think its only around $10 a year. Just in case anyone is interested in doing it on the cheap. Thanks for the comment. I checked out serveyoubetter.com and it certainly is low cost but it does miss some key elements of feedback management. For people looking for low cost approaches like this I normally suggest http://www.recommendi.com/. It is free and has some nice Net Promoter Score features plus the ability to set up unique QR codes to make it easy for users to access the survey.